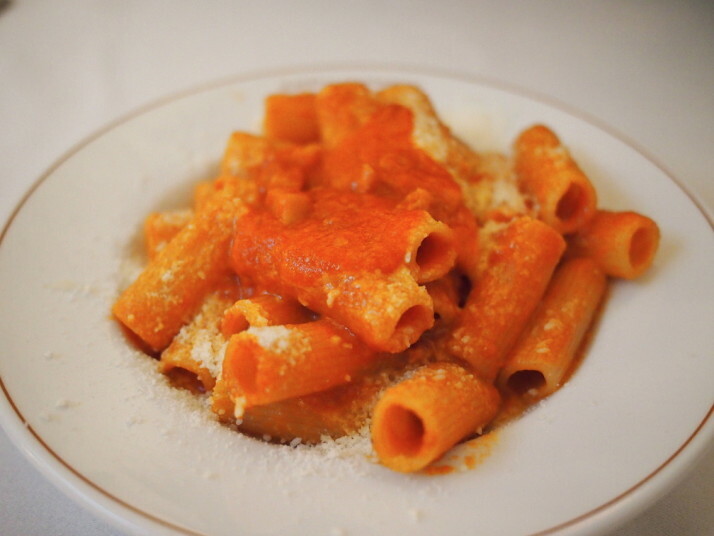 Similar to our experience in Istanbul, organised food tours in Rome are expensive but their itineraries are well documented so we pieced together a few of the highly recommended ones and made our own. We knew we’d be missing out on the introductions, stories and explanations, but the food isn’t too unfamiliar to our British palates as, say, Vietnamese..
After heading to the Testaccio area of Rome (Metro: Piramide), where most of the foody tours seems to operate, we joined the locals in Cafe Barberini to start our day with a working Italian breakfast of a cappuccino and a cornetto. 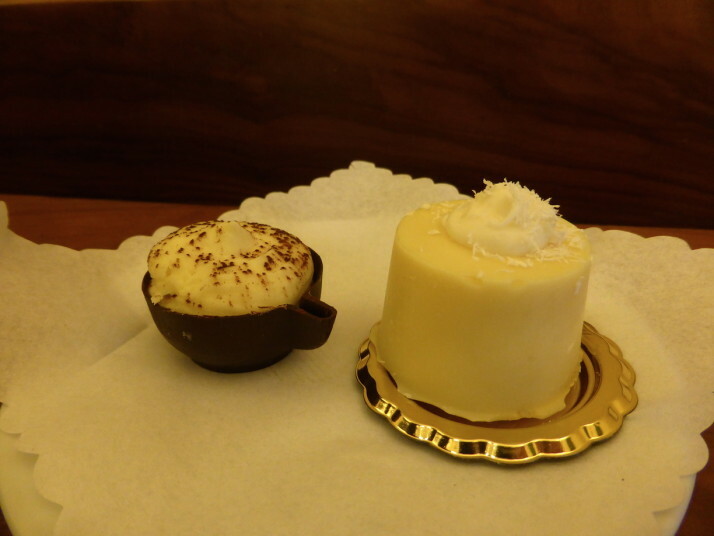 Cafe Barberini is also known for its hand-made chocolates, so of course we had to try one. 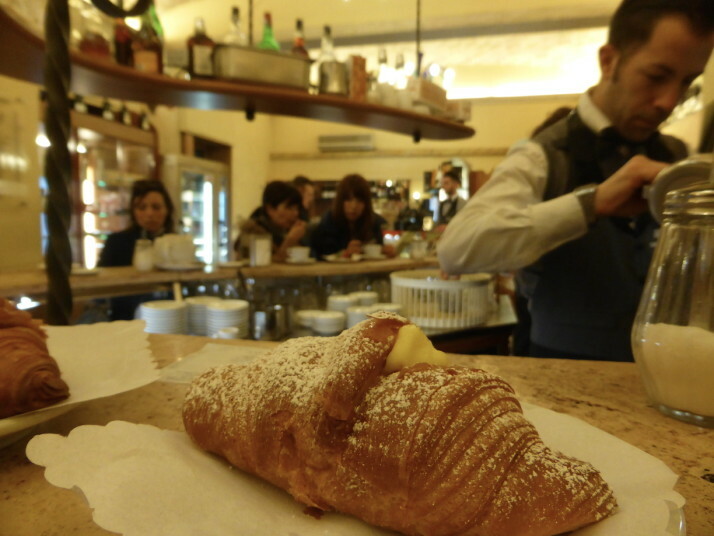 Or two..
Cafe Barberini is also a chocolateria. 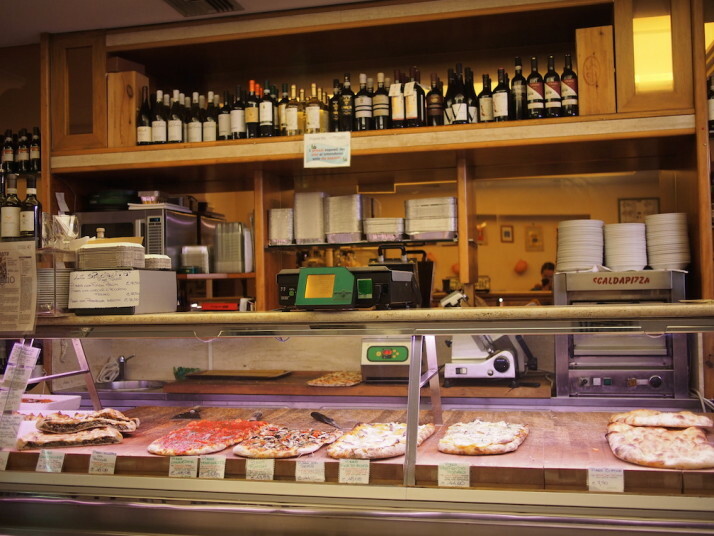 It was difficult to choose just one, but as this isn’t the first time we’ve eaten our way through a city we knew we had to pace ourselves..
Just a few doors down from Cafe Barberini is the family owned Volpetti delicatessen. 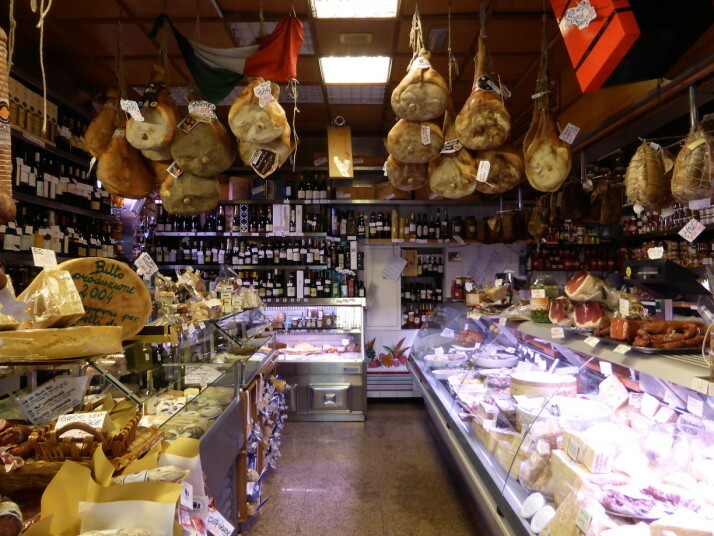 Volpetti’s delicatessen, we could spend hours in here, and hundreds of Euros too.. and we wouldn’t regret a cent! 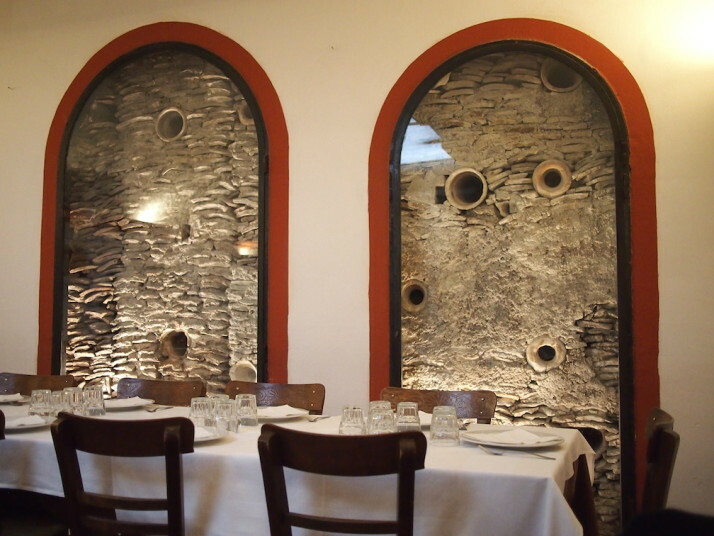 Inside, it’s a mouthwatering Aladdin’s cave of tastiness, as much a feast for the eyes as for the palate. Every conceivable surface is overflowing with delicacies. It’s absolutely wonderful. A close up of the cured meats and charcuterie section. Yum! We could have bought two of everything. 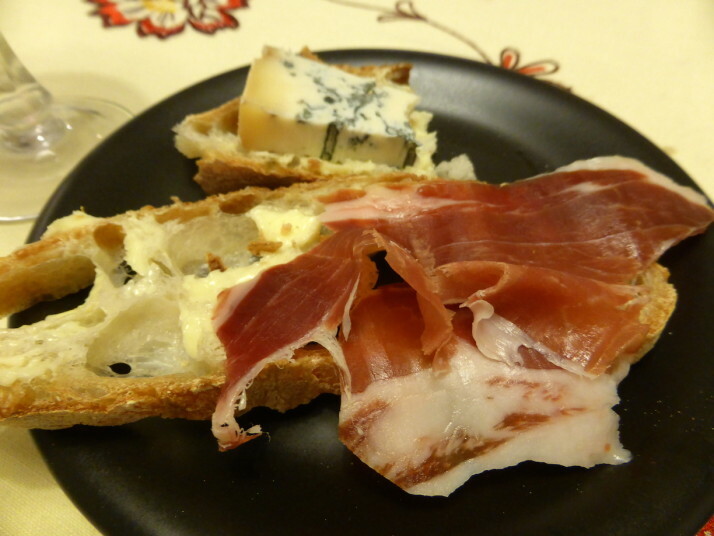 The owner’s son – a large man in typical whites and every bit the stereotype of a jolly butcher – offered us a taste of the sweetest, most mouthwateringly flavourful prosciutto we’ve ever tasted. The kind of ham that would convert vegetarians on the spot. Then another slightly smoked variety that I preferred. Who am I kidding, I’d have bought both! When we eventually tore ourselves from temptation, we reflected that it was fortunate we weren’t staying nearby, otherwise we’d completely blow our budget as we wouldn’t be able to resist popping in every day. You may have realised by now that we love markets – we have 15 posts about them! 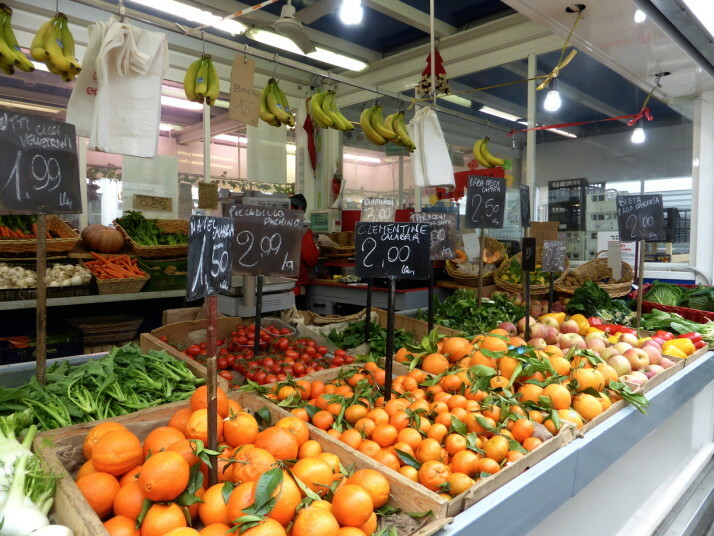 A typical fruit and veg stall in Testaccio market. We love the fresh produce in Italy – it tastes as good as it looks! 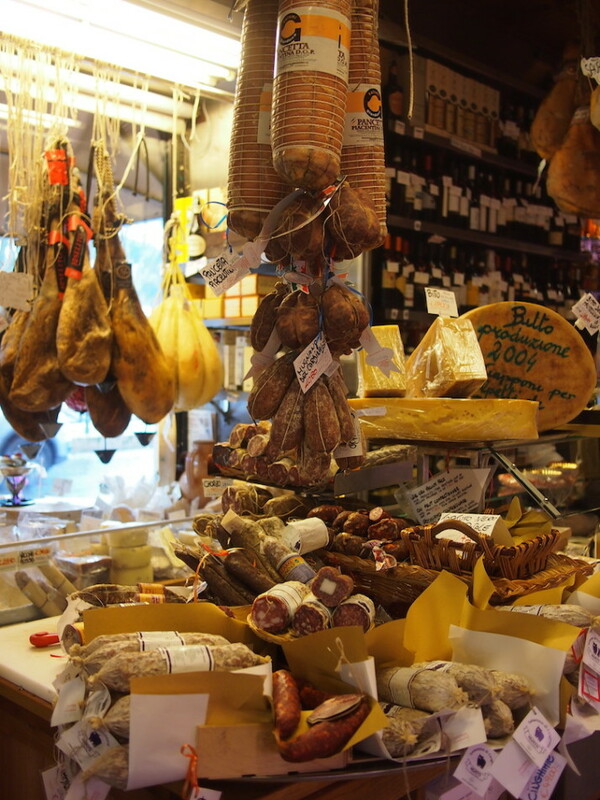 Originally located in Testaccio Piazza, this local market recently moved to a redeveloped block a few streets away. Most of the stall owners moved, some didn’t, and some new ones opened, though we understand it was quite the controversy at the time. It looked like almost all of the units were occupied though not all were open, but we enjoyed the variety. As usual for all markets in Italy, we found plenty of vegetable stalls, but also butchers, fishmongers, bakers, general dealers, two street-food and sandwich shops and a couple of household goods and clothing shops too. One of the top-rated attractions in Rome isn’t closed on Mondays, doesn’t have entry fees, and has but a few minutes queueing time if any.. 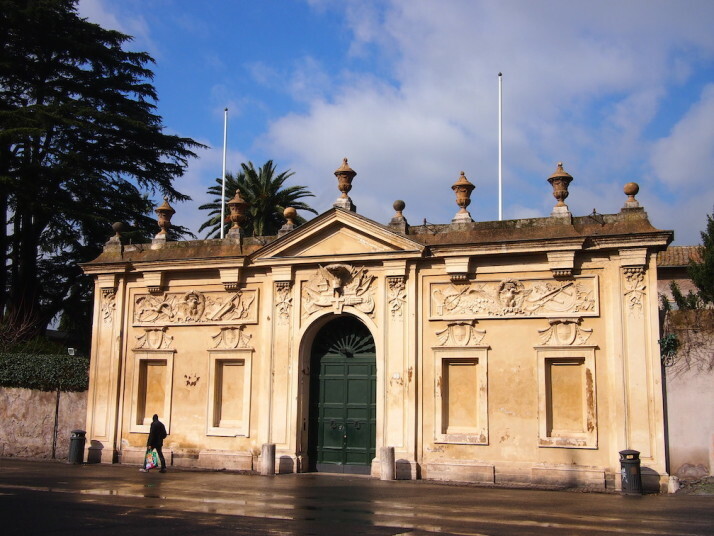 The grand but otherwise innocuous looking door of the Villa del Priorato dei Cavalieri di Malta. Still the reserve of the more off-the-beaten-path tours of Rome as it’s a little out of the way..
What’s all the fuss about? 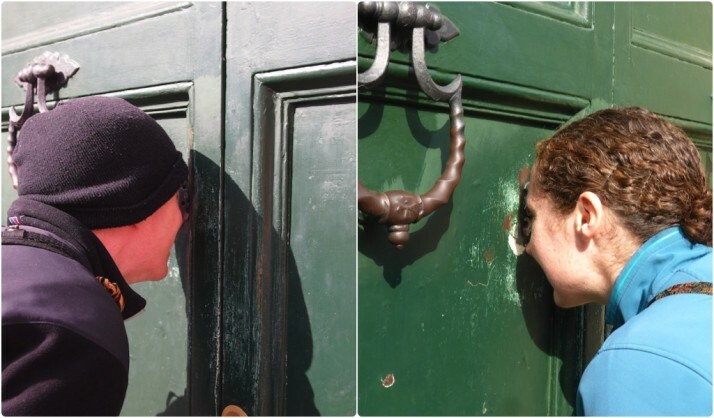 Why do private cars and taxis pull up, handfuls of people empty out and then peer through the keyhole of the Knights of Malta’s door? Even though we knew what to expect, it was worth the little uphill climb for the view..
It’s the dome of St. Peter’s Basilica! Perfectly framed by a tree-lined path. Nice, huh?! Sometimes there are inventions that as soon as you see it or it’s explained to you, you just think “that’s genius”. 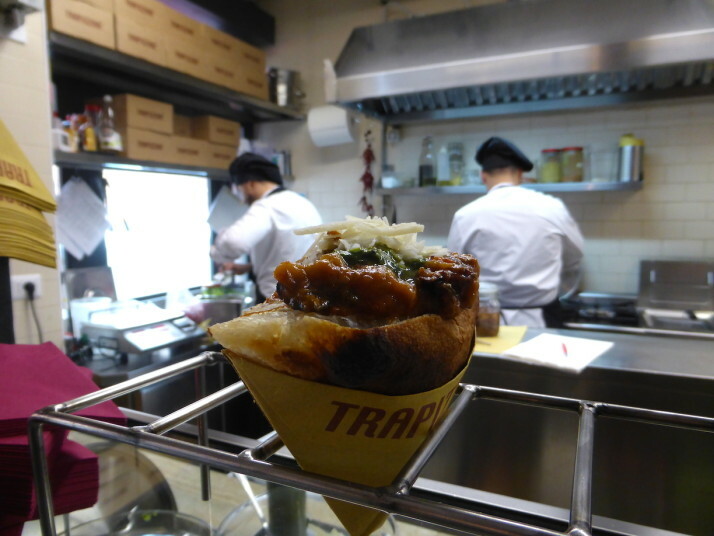 Trapizzino is one such culinary bathtub eureka moment – a fusion of freshly baked pizza dough corners filled with classic Roman stews put to use like sandwich fillings. The Trapizzino® – anything that starts with pizza is alright in my book, but then filling it with stew and topping it with cheese – genius! 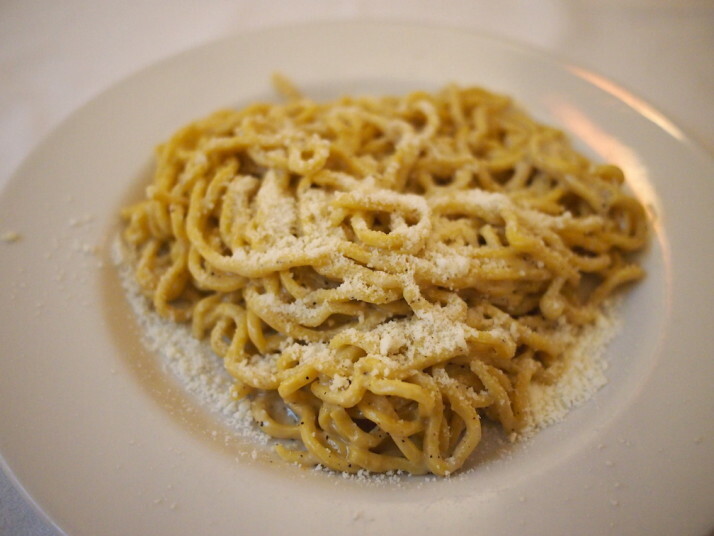 There were about 8 or 9 fillings available, including many Roman staples that involve offal or sweetbreads of some kind. Hmmm, where have I heard ‘sweetbreads’ before? We opted for the safe-sounding aubergine and parmigiana and it was very tasty indeed. Testaccio sits on the Tiber river that runs through Rome, and has a long history of river trade. For reasons historians don’t yet understand, clay amphorae or vessels that were once full of olive oil were disposed of as part of this trade and formed an artificial hill near the riverbank. They weren’t just thrown down or randomly discarded – although most lay broken, they were neatly stacked and today the hill is encircled by bars, clubs and pasta restaurants. We were happy to see suppli’ on the starters as we’d been looking out for it all day. 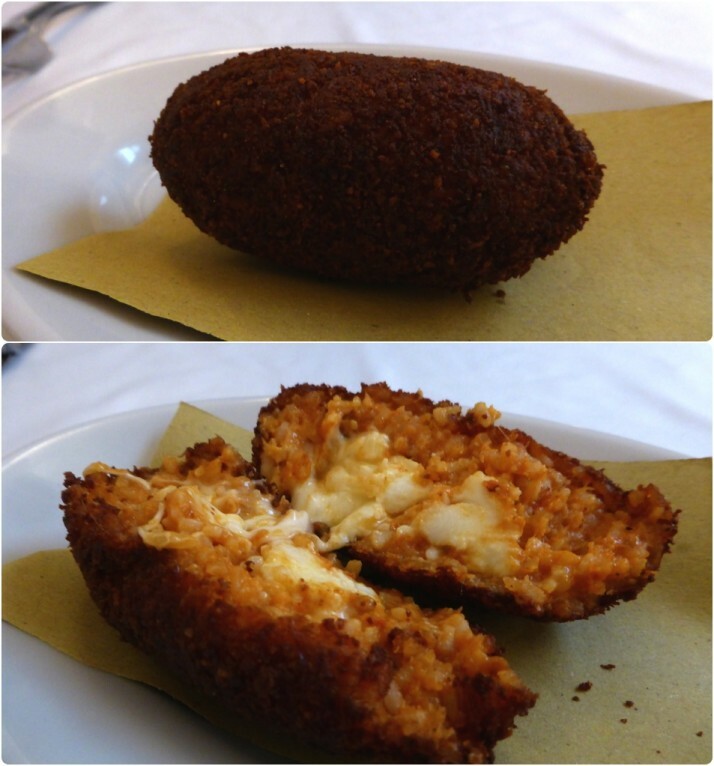 It’s the Roman version of the Sicilian arancini – a filled rice-ball coated in breadcrumbs and deep fried. 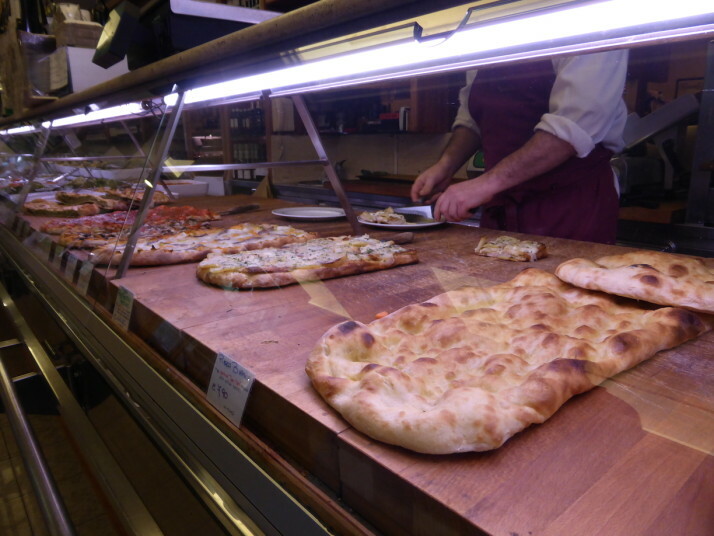 Fortunately it wasn’t as big as the Sicilian ones as we were starting to feel the pinch of our waistlines.. While we found somewhere to put it all, we wished we’d ordered half-portions or got one to share as we were stuffed! Time for another break, and just inside the old city walls is the Protestant Cemetery, also known as the Non-Catholic Cemetery in Rome. 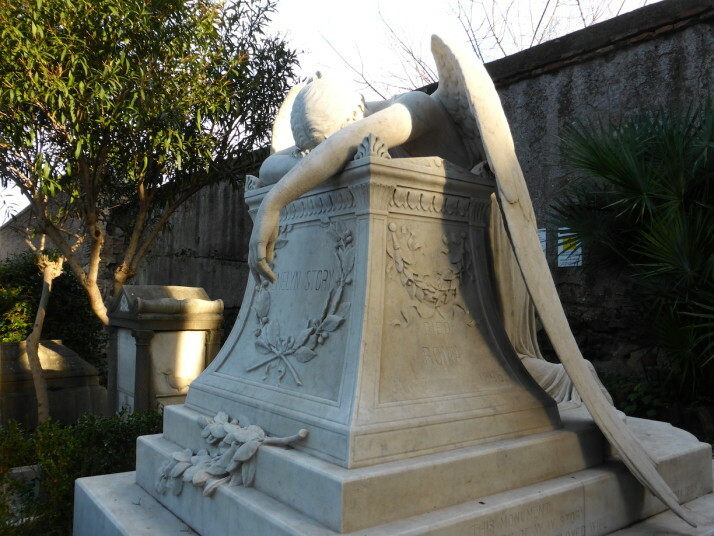 From their website..
Rome’s Non-Catholic Cemetery contains possibly the highest density of famous and important graves anywhere in the world. 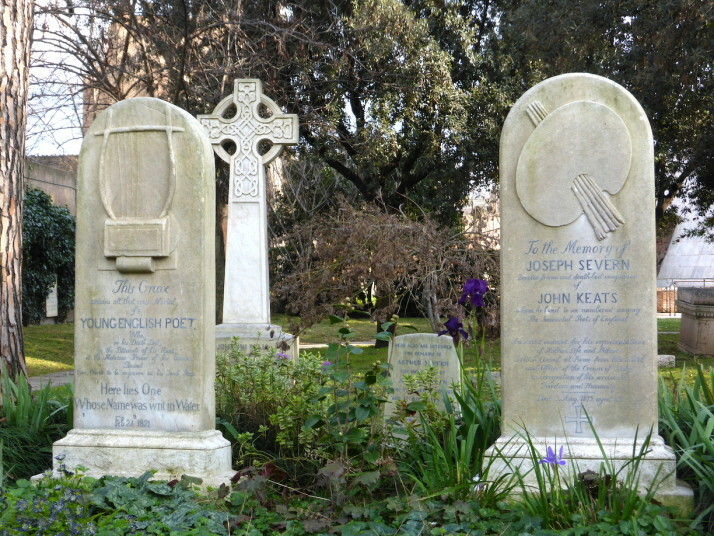 It is the final resting-place of the poets Shelley and Keats, of many painters, sculptors and authors, a number of scholars, several diplomats, Goethe‘s only son, and Antonio Gramsci, a founding father of European Communism, to name only a few. It’s a narrow, walled, claustrophobic cemetery pushed up against the old city walls. We were surprised how many different nationalities we spotted – it seemed like anyone who happened to die in Rome (and wasn’t Catholic) ended up here. We spotted the graves of an Indian ambassador to Italy, a Japanese man who passed away recently, and the grand-daughter of the King of Afghanistan among many others. Besides the historically famous, there were quite a few graves with elaborate headstones or statues, such as the one for Emelyn Story, whose husband was a sculptor.. 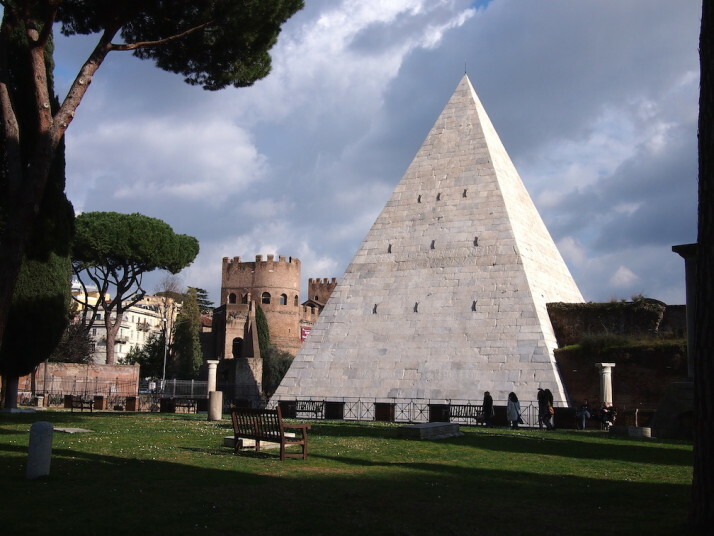 When the perimeter of the city walls were extended, they incorporated this marble-clad pyramid as one-half of a city gate, which, fittingly is also a grave – that of Gaius Cestius. Constructed in 18-12 B.C., far outside the centre of Rome it was lost to undergrowth, shrubs and trees. The final course – there’s always room for ice-cream! 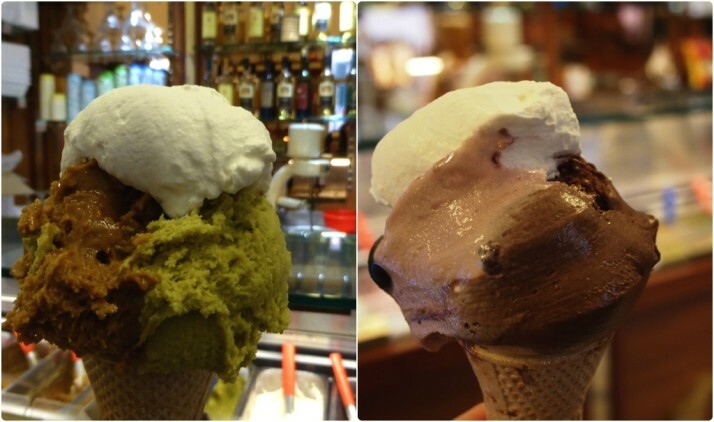 Giolitti’s is a particularly noteworthy gelateria, as all of the ice-cream is properly made (i.e. not whisked up from powders) and we’d read that they’ll refuse your combination of flavours if they’re deemed to be un-complementary! We agreed that the cherry and pistachio were the best flavours, and our combinations passed the test! Phew! When we got back to our apartment we needed a few hours to recover, kind of like that feeling you get after a really good family Christmas lunch. Similarly, later that evening we just wanted a little, light something to eat for dinner – then we remembered the prosciutto! I’m still wondering what I can ditch from my pack to make room for a whole leg of Parma ham.. 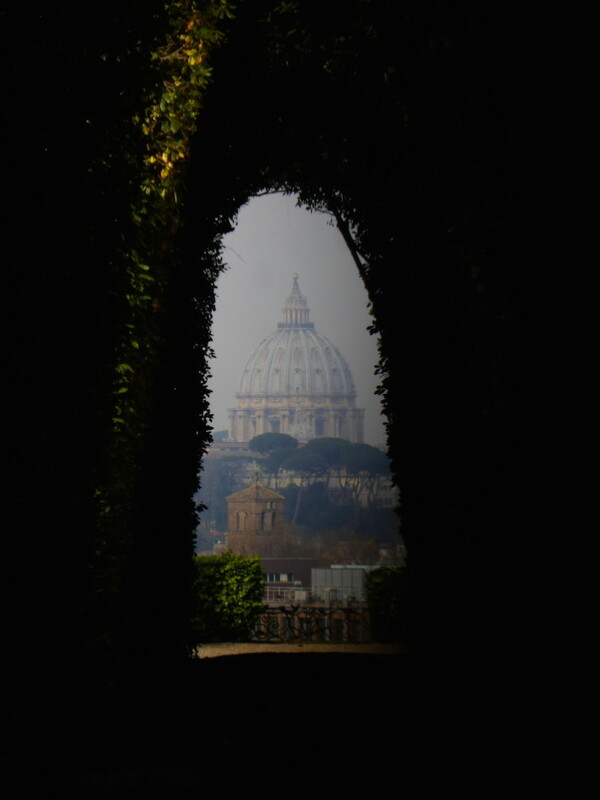 This entry was posted in Experiences, Places and tagged Cemetery, Food, Italy, Market, Rome on February 25, 2015 by Andrew. Haha! Now I have visions of the three of us tearing into a leg of ham like a pack of wild hyenas! What is 24 + 29 ?